Christopher Nolan is not a very emotive filmmaker, and for this reason is often mistaken for cerebral, which he isn’t. Nolan is a dork aesthete par excellence. Self-serious, literalist, fussy with intercutting, fixated on exposition, his movies snake around protracted reveals and delayed twists. His latest, the nearly three-hour Interstellar, comes closer to mimicking the feel and structure of 20th-century hard sci-fi in the Arthur C. Clarke mode than just about any other movie. It is an episodic, chunky film of over-explicated ideas and speculative set pieces: a race against the clock on a severely time-dilated planet; a spacecraft trying to outrun a mile-high tidal wave; trips through wormholes; treks across a world covered by mountain-like formations of frozen cloud. There’s a definite space-station-cover paperback charm to the way Interstellar practices sci-fi: the lean characters, known only by their surnames; the geeky cool of the old-school team robot, TARS, a bulky metal rectangle with a disconcertingly human voice; the wide-eyed garbling of textbook science. In its best stretches, which tend to come in the middle, it is a fatalistic adventure that pits peaceful science types against themselves and each other as they struggle to achieve a greater goal; in its worst moments, toward the end, it is a dopey exercise in humanist metaphysics, a movie about facing the cosmic unknown that explains everything several times over. In more ways than one, this is Nolan’s Solaris. Both movies open with a long stretch set around a country house on Earth, where the protagonist, a widower, must consider a mission to space from which he won’t return for years, possibly decades. In both cases, he’s leaving behind a young girl and an older man—his niece and father in Solaris, his daughter and father-in-law in Interstellar. Both films shift the action into space abruptly, are set partly to organ music (Bach in Andrei Tarkovsky’s Solaris and one of Hans Zimmer’s better scores in Interstellar), feature extended sequences of the protagonists watching and reacting to video recordings, and are about the emotions of people faced with the unknown. And, when it all comes down to it, both films are about how their respective writer-directors feel about the notion of the unknowable and humanity’s relationship to something larger than itself. Suffice it to say that Nolan is neither as confident nor as thoughtful a filmmaker as Tarkovsky, nor does anyone expect him to be. But as Interstellar’s space-time jargon gives way to maudlin truisms and increasingly New Age mumbo-jumbo about the power of love, a viewer might begin to wish that Nolan had ideas that went beyond making space exploration look as dishwater gray as photochemically possible. Interstellar’s hero is Coop (Matthew McConaughey), an engineer and former test pilot now eking out a living as a scrapper and corn farmer in a hopeless, depopulated future where the Earth is being ravaged by an agricultural parasite called the Blight. (One of Nolan’s more eccentric flourishes involves intercutting the early scenes with interviews with Dust Bowl survivors, who function like the talking heads in Warren Beatty’s Reds.) The United States government has long collapsed, and there are intimations of a global war that occurred in the distant past. In one of the movie’s standout sequences, Coop’s pickup rips through the cornfields, trying to catch up with a descending Indian military drone, hoping to get a hold of the solar cells that have kept it flying in circles, forgotten, for decades. Coop is raising his two children—whip-smart daughter Murph (Mackenzie Foy) and barely sketched son Tom (Timothée Chalamet)—with the help of Donald (John Lithgow), the father of his late wife. (For those keeping score, this brings the dead wife count in Nolan’s movies up to five, plus Rachel Dawes, who functions as a de facto dead wife in the Dark Knight films.) A mysterious gravitational anomaly eventually leads Coop and Murph to the NORAD bunker where the last remnants of NASA, led by Dr. Brand (Michael Caine), have put together a plan to relocate humanity to another solar system using a wormhole that appeared just behind Saturn half a century earlier. A dozen scientists have already sacrificed themselves by taking one-way missions through the wormhole in search of habitable planets; three have sent back promising data. Now a team—what the NASA folks call Plan A—has to go and find which one of the three planets is most suitable for resettlement. There are only enough resources for one mission and only a limited quantity of fuel, which sets up Plan B; if the team finds a habitable planet, but can’t return, they are to settle it themselves using thousands of frozen zygotes stored on their craft, and leave the Earth to die. Seemingly within 15 minutes of arriving at NORAD, Coop is asked to lead the team alongside Brand’s daughter, Amelia (Anne Hathaway). Because of the effects of relativity—which Interstellar explains at least five times—several decades will pass on Earth while Coop, Amelia, Romilly (David Gyasi), and Doyle (Wes Bentley) will be away on their mission. Nolan is a frustratingly haphazard visual stylist, fixated on celluloid formats (Interstellar was shot in anamorphic 35mm, IMAX, and VistaVision), limited color schemes, and lens flares, but incapable of organizing space or structuring a shot in which more than one thing happens. Sometimes, this incoherence works to his advantage; it takes a good hour of close-ups and chopped-off compositions to figure out the dimensions of the robot TARS (voiced by Bill Irwin), which makes him seem all the more otherworldly as both a character and a piece of technology. Actually, many of the things that make Nolan a sub-par action director also make him an engrossing pop storyteller; inconsistency might kill a chase scene, but it works like gangbusters when it comes to composing a plot twist. In Interstellar, he has something of an advantage, in that his usual problems with space and time—the question of how long Bruce Wayne spends in that prison, and how the hell he gets back to Gotham—are woven into the narrative; here, the characters travel through a literal plot hole. This produces some of the most graceful moments of Nolan’s career, like the seamless initial transition from Coop’s perspective to the perspective of the grown-up Murph (Jessica Chastain). However, as in many of the director’s works, the cross-cutting grows heavier and more frenetic as the movie goes on; the early, Earth-set scenes are almost atypically straightforward, but, by the time-bending climax, it begins to feel as though the movie will collapse under the weight of all of its parallel lines. Throughout, Zimmer’s music, with its ascending organ figures, begs rapture, and every now and then, the movie’s effects team manages to pull together an imaginative moment, like the one where space seems to crawl out from under a spacecraft as it slides into the wormhole. Though Nolan—who penned the script with his brother and frequent collaborator, Jonathan—has a knack for self-contained turns of phrase (“Mankind was born on Earth, but it was never meant to die here” is this movie’s “the hero Gotham deserves, but not the one it needs right now”), he’s never been much of a dialogue writer or director. The best back-and-forths in his movies—like the various behind-the-scenes reveals in The Prestige—are essentially cut-up monologues, interspersed with questions and delivered in tantalizing chunks. With the exception of McConaughey, Irwin, and Matt Damon—who has a focused turn as one of the scientists sent ahead of the main team—every actor is given what’s essentially a thankless role, tasked with behavior and expository dialogue that ranges from impersonal to downright dumb, like the scene in which Romilly explains to Coop what a wormhole is—using the exact same pen and paper trick as Event Horizon—just as they’re about to finally fly into one. 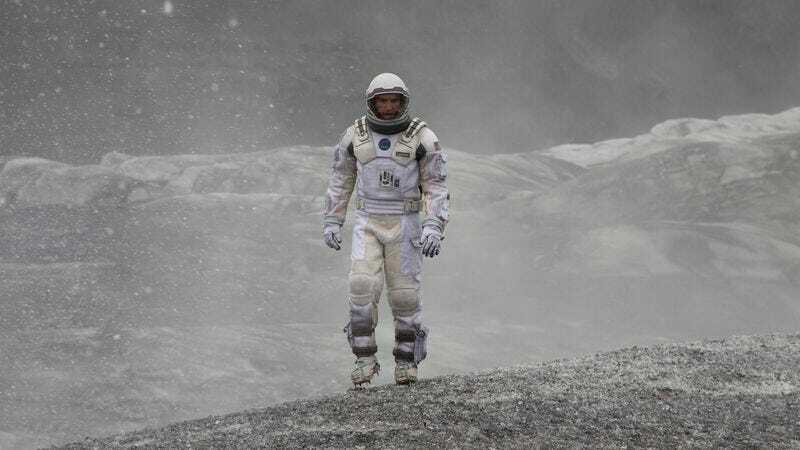 Still, despite—or perhaps because of—its flaws, Interstellar manages to convey something of the spirit of sci-fi literature that’s usually missing from film. Its ungainliness and inelegance speaks to an enthusiasm that can become engrossing in and of itself; it’s crazy about the silence of space, the mechanics of long-term space travel, and all of the other little things sci-fi movies usually streamline out. Considering that both the team’s away missions—which find them descending on to unfamiliar planets to investigate the scientists’ signals—and the Earth scenes could function as self-contained, twisty short stories, it’s almost easier to think of the film as an anthology of sci-fi tales, with the relationship between Coop and Murph serving as the underwhelming, two-part wraparound. 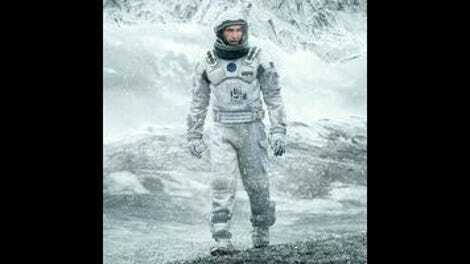 For thoughts on, and a place to discuss, the plot details not talked about in this review, visit Interstellar’s spoiler space.